I was helping my college age daughter clean out her room this past weekend in an effort to get her organized for the packing extravaganza that was going to take place this week in preparation for her return to college. She left today : ( I love to go through every nook and cranny and weed out items that are not longer wanted or used. I am not by nature a saver. In going through her jewelry we came upon her charm bracelet. A delicate gold chain with about 20 charms hanging around it. We gave each of the girls a bracelet for Christmas one year when they were probably 6 or 7. Each birthday, holiday or special vacation we would try to find an appropriate charm to add to the bracelet. They were small charms and the girls have since out grown them but love them just the same. It was such fun to look at each charm and talk about the significance or special memory behind them. I have always loved charm bracelets and don't feel that they have ever gone out of style. They are timeless and represent our lives as we evolve and grow old. My grandmother had wonderful charm bracelets and my mother still wears hers with the addition of the charms she inherited from my grandmother. I am in the diamond business and a client came in the other day with an engagement ring and wedding band that were his grandmothers. He wanted to do something with them and present them as a gift to his wife for an anniversary. The rings certainly held great emotional significance to this client but were small and due to the age, they were his grandmother’s rings, the cut was not what it should be on the round diamonds and they did not have any sparkle, fire or brilliance. We very kindly suggested that maybe he should consider another alternative versus simply resetting them in a piece of jewelry that his wife may or may not ever wear. We suggested starting a charm bracelet and adding the rings to it in there original form. That way they would be preserved and the bracelet could be added to in the future. He was thrilled with the idea and thanked us for all of our help. Taking a sentimental piece of jewelry that would, under normal circumstances, just sit in a jewelry box and turning it into something that can be worn and enjoyed as well as being a conversation piece I think is a wonderful gift. It is my opinion that jewelry is no longer viewed as an indulgence. Whether you are buying an investment piece or something fun, faux and trendy it makes a statement about your personal style as well as your mood. You do not have to be stuck wearing the same pieces everyday and changing your jewelry does not have to cost you a fortune. There are some wonderful pieces out there that look just like the real thing at a fraction of the cost. Building a jewelry wardrode is a process and reflects not only your style but can be characterized by the times. Here are some tips and suggestions to creating your own stash of goodies. Every woman should have at least two watches. One for everyday that is durable and large enough to read that can be worn with a suit or with jeans. Leather straps, which now come is a bevy of fun colors are always classic but keep in mind that they will need to be replaced in time with wear. Metal bands will last longer and can get slightly wet if necessary. A simple dress watch is also a nice piece to own. Something elegant for evening, possibly with some diamonds around the face to dress it up further. Diamonds are no longer reserved just for evening wear. Everyone should own a pair of diamond stud earrings and enjoy them during the day no matter what you are wearing or your age. If the real thing is not an option most fine department stores sell wonderful fakes in all shapes and sizes. 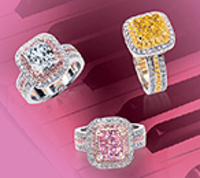 Stick to the realistic one to one and a half carat range set in white gold. No one, I promise, will ever know the difference unless you tell them they are not real. Diamond chandelier earrings are also still popular for the evening. Not too big though, just long enough to catch the light and shimmer in a flattering way. Brooches go in and out of style but to own one or two can really make for a versatile piece of jewelry and can dress up any suite or outer wear. You can also get creative and wear them in your hair, clipped to a multiple strand of pearls or pin one on your plain handbag to dress it up. Do not wear too much jewelry at one time. It is ok to layer on the bracelets or wear multiple long necklaces at once but please don’t do them at the same time. You will look as though you are six years old again and are again playing dress up. If you have been given a piece of heirloom jewelry from a family member or good friend, enjoy it, wear it. Don’t keep it hidden away in a safe place. Everything is in right now so you can’t go wrong with the style and hopefully it will bring back fond memories. While classic fine jewelry is always a good investment and will remain timeless today’s retailers offer a wide variety of choices at every price point. Experiment, enjoy and let go of your creative side. Shop On!!!!! There is nothing more relaxing that a nice weekend getaway with your family, especially this time of year with the warm weather. Whether you are headed to the beach or the mountains packing should be simple and practical. It is easy to claim that most travelers pack too much, but I am not so sure that is always the case. True, nobody wants to lug a giant suit case with them but you also do not want to get caught in an unfamiliar area without the essentials and have to spend valuable vacation time shopping for the basics that should have been included in the first place. I have listed a few of my favorite tips that I hope you will find helpful. If you have to pack your toilet items and cannot carry them with you, put them in separate zip lock bags. This way if they leak they won’t ruin your clothes. Go through your daily routine of getting ready and either write the things down as you use them or pack them after you use them as to not forget anything. Be especially mindful of medications as these are more difficult to replace away from home. Packing a small bag of medicine for headaches, stomach aches, poison ivy, allergies, etc is always a good idea especially if you have children. Pack clothes that are prone to wrinkles in plastic bags. Dry cleaner bags work especially well. Also, if you roll up sweaters instead of folding them, you’ll avoid the wrinkles that way too. Use the plastic bags that your newspaper comes in to put your shoes in. They are see through so you can find which pair of shoes you are looking for and it also protects your other items from getting dirty. Pack one or two extra plastic garbage bags. They come in very handy to use as laundry bags or for wet bathing suits that were used at the last minute before leaving. The list can go on and on but those are a few of my favorites. Pack your favorite items to wear that you always feel comfortable in and remember that shopping should be a part of every getaway trip. You never know what wonderful things you will find. Enjoy, relax and be happy. On all three points, men act out of fear of making a mistake. Their pride and desire to surprise their girlfriend typically prohibit them from asking the woman’s advice. As men so often do, they try to apply logic to what is a very emotional decision. The man’s first stop is often the jewelry store in the closest shopping mall. They walk in the door and realize they just entered a world foreign to them. They look at rings in the display cases and see more zeros in the price tag than they have seen since they bought their car. Their heart starts pounding as they realize they have to spend thousands of dollars on a tiny little rock they know nothing about, then give it away to someone else or worse yet, face rejection. Now their legs are shaking so they decide they need to do more research and do it in a friendlier environment. They head home, turn on the computer, and start searching online for clues on how to survive the diamond buying process. Their goal is to find a pretty ring their girlfriend will like and have a few dollars left in their pocket. They feel more comfortable with the discussions of the four C’s (color, clarity, carat weight and cut) where they can match up those letter grades with their budget to find some possible options. However, with a little knowledge comes the sinking feeling that there is a whole lot more for them to learn in order to protect themselves from making an expensive mistake. 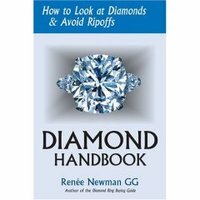 They become even more determined not to make a mistake so they spend the next weeks and months gathering ever fact and opinion they can find on diamond buying. It is almost like trying to get a drink from a fire hydrant. There is just too much to drink in. Whether it is the sparkle of a princess’s necklace or a beautiful bauble gleaming on the left hand of an actress society has long been fascinated with celebrity jewelry. If offers the fans an intimate detail about their favorite stars. Tom Cruise presented his fiancé Katie Holmes, and now the mother of his baby daughter, with a 5.5 carat oval diamond in an Edwardian-style ring with over six carats of smaller diamonds outlining the oval and on the shank. The late Princess Diana wore an 18 carat oval blue sapphire with fourteen diamonds surrounding it. Catherine Zeta-Jones’ engagement ring from Michael Douglas was a spectacular 10 carat marquise diamond set horizontally. And Reese Witherspoon’s 4.5 carat Asscher cut diamond is set in a beautiful 1920s art deco style mounting. Most of these engagement rings are out of reach for most newly engaged couples but you can recreate these looks in many ways. For example, in order to afford a larger center stone you could use 14 karat white gold for the mounting instead of the much more expensive platinum. Another way to get that big look without a big price tag would be to pave tiny diamonds around the center stone. 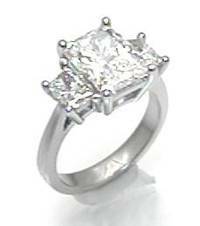 It will make the center stone appear much larger and will also add to the sparkle of the ring. 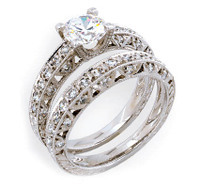 Three stone rings are also very popular, and not just for anniversaries, and it creates a larger overall look. As we say goodbye to February and welcome in March our thoughts go to the "luck of the Irish" and the traditional clover leaf that has been transformed into beautiful jewelry. Van Cleef and Arpels created their popular clover chains in a variety of lengths and colors and Mouawad made the clover famous with the Heidi Klum Collection which features a diamond encrusted clover pendant. And California jewelry designer Carl Blackburn was inspired to create chandelier clover and heart earrings with pave diamonds and had this to say about the power of the clover: "Few symbols are more evocative for jewelry than the four leaf clover. Luck, faith, hope, and love are all captured in this iconic symbol from Nature." There is also an extremely unique cut of diamond called a "Lily" cut that forms the perfect four leaf clover shape. Find out more about that beautiful cut at the link below. May the "luck of the Irish" be with you!